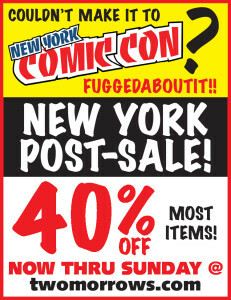 Whether you couldn’t make it to the New York Comic-Con last weekend, or left wishing you’d bought more stuff at our booth, you get another chance during our New York Post-Sale! Through this Sunday, Oct. 15, our webstore is a virtual version of our NYCC booth, complete with the same 40% OFF we offered last week in the Big Apple, on everything except new releases! But just like the actual NYCC, you’ve only got Thursday, Friday, Saturday, and Sunday to take advantage of this special offer! And while you’re shopping, be sure to preview all our new items, just like at the actual convention! The 40% OFF applies only to PRINT editions, and does not include subscriptions, bundles, and new or upcoming items. And just like the NYCC, it ends promptly at 5:00pm EST on Sunday night. This entry was posted in TNT on 12 October 2017 by Mr. Morrow.